This content was sponsored by Olay. As always, all thoughts and opinions are my own. Thank you so much for supporting the brands who make Diary of a Debutante possible! I’m about to turn 30. If I could tell my 20-year-old self one beauty secret, it’d be to protect my skin from the sun at all costs. In my early twenties, while living in a state famous for its sunshine, I spent an embarrassing amount of time in tanning beds. I also refused to wear sunscreen and developed Squamous Cell Carcinoma as a result. Hyperpigmentation, dark spots, and a giant scar on my back are constant reminders of the sun damage I subjected myself to. And for what? To look tan for an extra few days? Sometimes I want to reach back ten years and smack myself! Unfortunately, I can’t change the past, but I can and have taken proactive steps to mitigate the damage. One of the most effective steps was choosing to wear a daily face moisturizer with SPF, like Olay Total Effects Anti-Aging Moisturizer with SPF 15. It breaks my heart that even though 2/3 of women know they should wear SPF daily, only 1/3 actually do. Now that the warmer months are here, I’m going into full-blown mom mode and pleading that y’all wear SPF every day. Trust me, I understand that facial sunscreen isn’t super attractive. It’s greasy, and it makes me break out. So, I opt for wearing an oil-free daily moisturizer with SPF. If you need product recommendations, Olay Total Effects Anti-Aging Moisturizer has my vote for the best daily face moisturizer with SPF. Its sheer lightweight formula is super easy to wear, doesn’t irritate my skin, and absorbs quickly. Plus, it’s packed with vitamins that leave my skin looking and feeling healthy almost instantly. My mom recommended it to me, and I’ll be recommending it to my daughter(s), as well. To help test these benefits first hand, I replaced all my prestige skincare products with Olay for 28 days. It was one of those eye-opening experiments that reaffirmed skincare doesn’t need to be expensive to be effective. In case you’re interested in conducting a similar experiment at home. As scary as it is to be entering my thirties, it’s given me a lot of introspective insight into how much my beauty habits have evolved. I never thought I’d see the day when acne wasn’t the bane of my existence. That being said, I don’t wear much makeup these days. However, I literally never leave the house without moisturizer with SPF. I love knowing that whether I’m at the beach or I’m taking Nala on a quick walk in the park, I’m protected– and I’m taking proactive steps towards preventing skin aging. 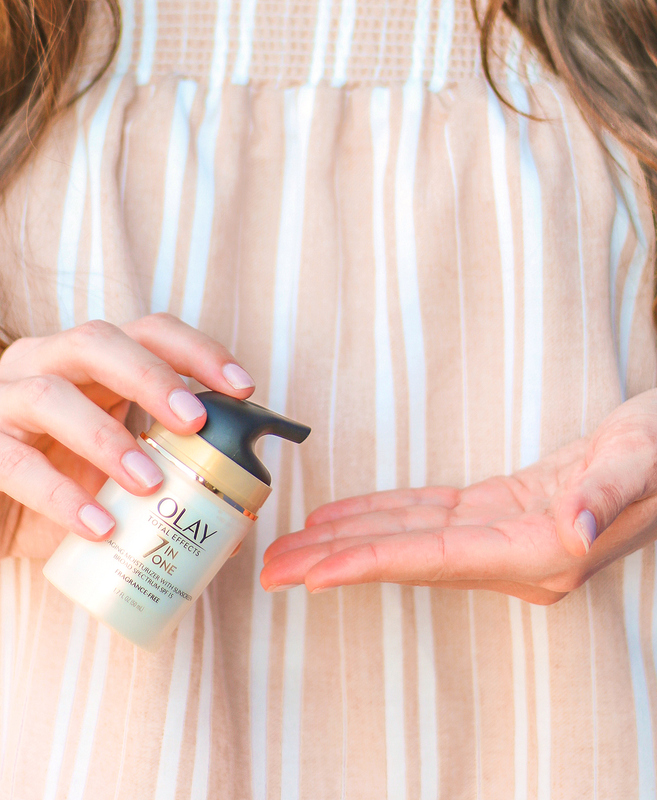 I’m in no way surprised that Olay Total Effects Anti-Aging Moisturizer has become a fan favorite and designated staple in so many women’s skincare routines. Pick up a bottle here and give it a try for yourself! Whatever you decide to do, please, please, please keep that gorgeous skin of yours protected this summer!